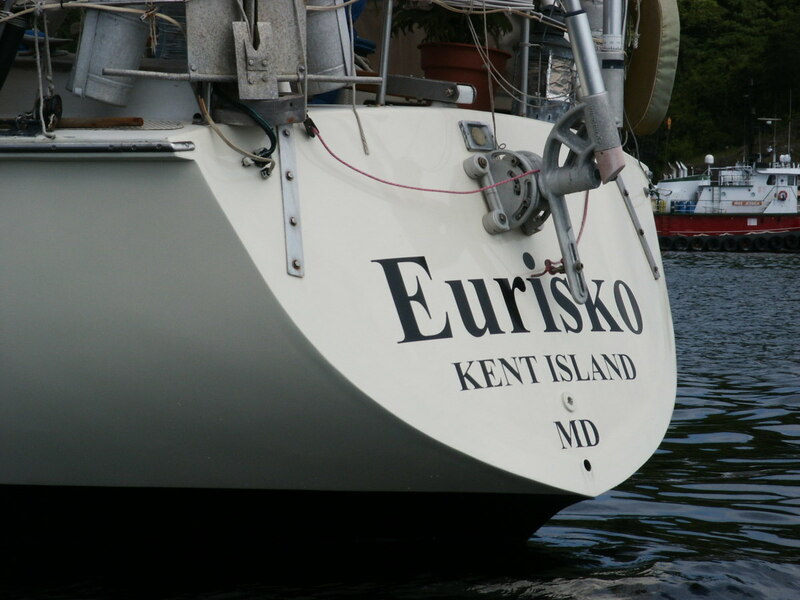 Like many boats, Eurisko has a reverse transom that has a hard life. In her 30 years, it has come in contact with countless hard objects. Each has left its mark. Once I finally noticed the damage that was being done, I started inspecting other reverse transoms and discovered we were not alone. First, he marked both sides of the hull and transom 3in from the edge, using a compass with a Sharpie in place of the pencil, which more than covered all the dings. Next, he used some 24-grit disks to grind down from the edge to just shy of the marks. As he did so he ground straight down, as opposed to feathering the edge, to give the cloth a place to lie without sticking up above the transom and hull. When we’d first discussed this project years earlier, Dave had planned to wrap the end of the transom with fiberglass tape. However, since fiberglass will not conform to compound curves, he would have had to cut it at very close intervals to allow it to lie flat. Then he built a wooden, lap-strake dinghy that he wanted to reinforce. Again, fiberglass would not conform to the curves, so he used Dynel cloth. Dynel’s flexibility impressed him, so he decided to use the leftovers for our transom project. A word of warning: Dynel requires much more epoxy to wet out than does fiberglass, so we had to plan accordingly. Dave cut the Dynel into 4in-wide strips. This is best done with a hot knife or scissors. Dynel grows considerably when it is wet out, so 4in strips left 1in on either side for growth and ensured that the Dynel did not go past the ground-out area to be filled. Too small is better than too big. At this point, Dave and I donned our gloves, respirators, glasses and hats—we have a habit of standing up under wet epoxy. Then, after dry-fitting the Dynel to be sure we had cut enough, Dave mixed up the first batch of epoxy and painted the transom with neat epoxy before applying the Dynel. This prevents epoxy starvation, in which the fillers already on the hull absorb epoxy from the cloth, leaving it too dry to make a good bond. Next, Dave laid the dry Dynel on the hull, using his epoxy brush to help it conform to the compound curves. Since Dynel holds so much epoxy and is very flexible, wetting it out first would have created a mess, and we always strive to neither waste nor wear any more epoxy than absolutely necessary. Had he used fiberglass tape he would have wet it out before applying it to the hull. Once the Dynel was in place, Dave used copious amounts of epoxy to wet it out. The cloth should be completely wet, but not floating on epoxy. After that, we allowed the epoxy to “go green,” or reach an early stage in the curing process where it’s no longer tacky, but you can still dent it with a fingernail, before starting in with the fairing and adding another layer. Doing so allows for a primary chemical bond to be established. Basically, at a molecular level, the two layers become one through cross-linking. If the epoxy is allowed to completely cure before fairing, there is only a secondary bond—one layer adheres to the other. Obviously, the first scenario is preferable. As part of the first fairing, Dave used a block plane to remove any fringes of Dynel sticking above the hull, then repeated the process with another layer of Dynel. Again, we allowed this layer to “go green,” then mixed a batch of epoxy thickened to the consistency of peanut butter with a little colloidal silica and bulk micro-balloons. You know the mix is right when you can hold up the stir stick and there are no drips. Be careful, however, that the filler is not too dry, as it will drag and leave air pockets. Since it is almost impossible to thin the mixture once you have added fillers (you are better off throwing it out and starting over), start out with the mixture too thin and add a little filler at a time. Be sure to use a new mixing pot, stir stick and brush so that you do not speed up the curing process. After the epoxy cured, Dave sanded and faired several times until he was happy with the results. 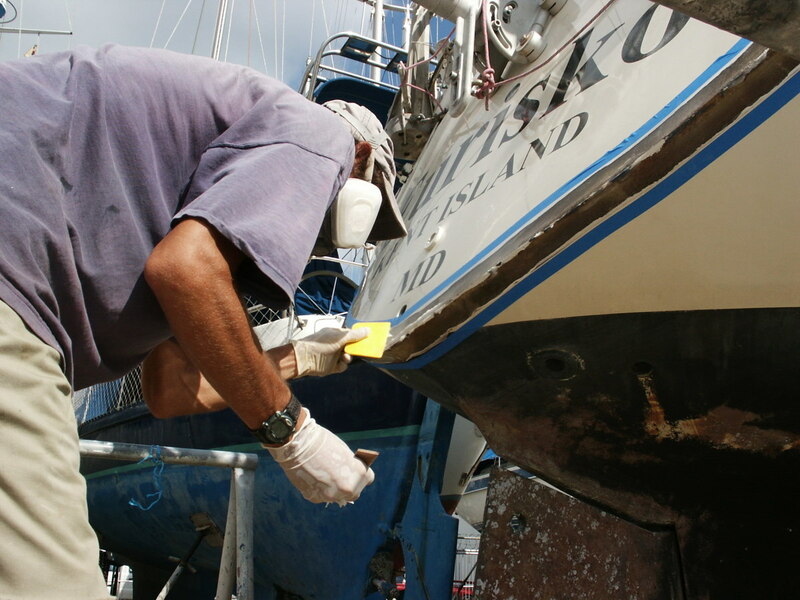 He used a straightedge to verify that the patch met the hull and transom since it is difficult to be sure by eye. He then washed the patch with soap and water and a 3M pad to remove any amines the curing epoxy created and sanded to the line on the transom and hull using up to 180 grit sandpaper. After that he taped off the area just outside the Sharpie line since we did not plan to paint the entire transom. We primed the area with a two-part Awlgrip primer, sanded with 180 grit, and applied two coats of Awlgrip two-part paint, wet sanding between coats. It is never possible to get good coverage with only one coat of paint; by trying, you will only succeed in applying too much paint, and it will sag or run. We peeled the tape before the final coat was completely dry, allowing the edge to flow out on its own. After the paint was completely cured, Dave sanded out the rough edge with 320 through 800 grit sandpaper, then used a buffer to finish removing any remaining edge. While I think the results are astounding, Dave does not consider it his best work. In a perfect world, we would have painted the entire boat, rather than just trying to hide the patch. We were already scheduled to be on the hard longer than I can generally tolerate, and this was but one of many projects on the list, so we invested no more time and money into it than necessary.